The plushies for Japan Relief Done Quick are starting to accumulate! Joining Mr. Saturn is a very different friend: Meat Boy! (Ravelry project page here.) I’m very happy with how he came out! 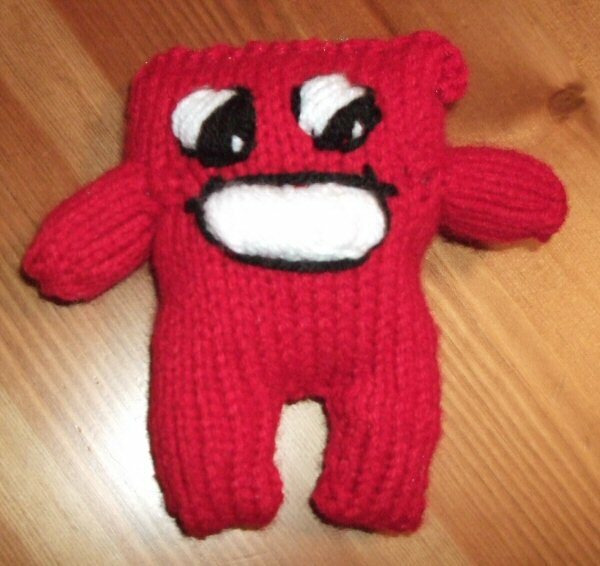 He is 5″ tall and squishy (though not full of meat, just polyester fiberfil). You could win him if you donate $5 or more to Doctors Without Borders during Japan Relief Done Quick!